Janis Zettel of Clearfield City, Utah was given a non-running ‘73 Volkswagen Super Beetle as a gift by her son. While neither her nor her son was that interested in getting the Beetle running, Zettel liked the car, which she named Lucy and painted to look like a ladybug. Deciding the car made her happier as lawn art, she had it placed in a tree in their front yard. Now, Clearfield officials are demanding it be removed because, I suppose, they hate fun. The Super Beetle had its engine removed and most of the interior stripped prior to being made arboreal. A neighbor with a forklift (that’s handy!) 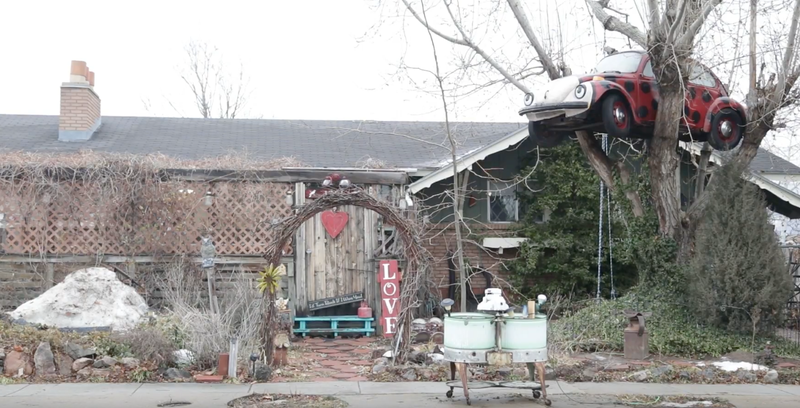 placed the VW in the tree, and the car was bolted and chained securely to the tree. So, if it’s safe, on this woman’s own property, and not hurting anyone, what the big deal? The big deal seems to be that the city is considering the tree-borne Beetle a “nuisance vehicle,” and demanding it be removed from the tree, on penalty of a Class B misdemeanor. Zettel maintains that the VW is no longer a vehicle—“It’s not a vehicle anymore—there’s no engine, there’s nothing in it,” and that the car is better considered artwork in its current state. This makes sense to me; it can only be a nuisance vehicle if the thing is still a vehicle, which this Beetle clearly is no longer. Leaving a nuisance vehicle or vehicle parts in your yard is also a violation of the city ordinance. The city defines an abandoned vehicle as a vehicle that has not been registered 180 days after the date on which the plates have expired or is wrecked, dismantled, partially dismantled or otherwise rendered inoperable. I don’t think this would apply to the Zettel’s VW because the paint and placement clearly demonstrate her intent for the car to become a sculptural work as opposed to just some neglected project car sitting in a driveway. Zettel isn’t living in an area with an HOA, and the Beetle in the tree wasn’t doing anything other than delighting her grandchildren and anyone around who isn’t dead inside. Even if it’s not the type of artwork a given person may personally enjoy, that hardly matters, because it’s on her private property. The tree-Beetle became an issue because a neighbor complained. A neighbor who, it should be noted, does not own Zettel’s property, and who’s opinion on decor Zettel has never solicited. Zettel has a petition started to help her case when she argues in favor of being able to keep her artwork at a hearing today. She currently has 832 out of a goal of 1,000 signatures. Come on, people. This is fun, it’s not hurting anybody, it’s novel and a nice break from mundanity. Let the lady keep her giant ladybug.